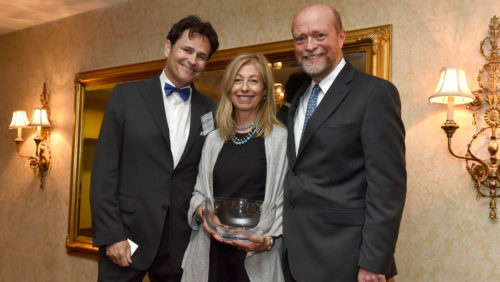 Bruce (L’80) and Ann Blume (Parents ’08, ’20), shown here with Georgetown Law Dean William M. Treanor, have given $10 million to establish the Blume Public Leadership Institute. Bruce (L’80) and Ann Blume (Parents ’08, ’20), have given $10 million to establish the Blume Public Leadership Institute at Georgetown University Law Center. The gift represents the largest one-time commitment in the history of Georgetown Law. Through the Blume Institute, students exhibiting exceptional promise as future public leaders will receive full-tuition scholarships as Blume Scholars. They will engage in traditional and experiential legal studies, while training for lives of service as public officials, policy makers, thought leaders, entrepreneurs and visionaries. Bruce (L’80) and Ann Blume. 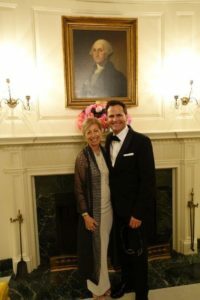 A 1980 graduate of Georgetown Law, Bruce Blume serves on the law school’s Board of Visitors and the Georgetown University Board of Directors. Georgetown Law has substantially expanded its experiential programming and financial aid for students under the tenure of Dean William M. Treanor. “In years to come, I fully expect to see Blume Scholars emerge as leaders in all branches of federal and state government, as well as at major nonprofits, NGOs, and in the business sector,” Treanor continued. Bruce Blume is founder and Chairman of Blume Company Real Estate, a development firm that has helped transform Seattle’s skyline. Previously he worked as an attorney, a clerk for U.S. District Court Chief Judge Walter T. McGovern and as a legislative aide to U.S. Sen. Warren G. Magnuson. He serves on the boards of the Seattle Art Museum and the University of Washington Foundation. Ann Blume is a community leader in Seattle. A graduate of Cornell University, she is a former staff assistant to U.S. Sen. Bob Packwood of Oregon and U.S. Sen. Slade Gorton of Washington. She serves on Seattle University’s Board of Trustees and College of Arts and Sciences Leadership Council, as well as the Cornell University College of Human Ecology Advisory Council. Together, the Blumes founded the Bruce and Ann Blume Fund, supporting public health, educational, and environmental endeavors. The parents of five children, they share a passion for family, public policy, and philanthropy.